The MILES FOR MARSOC Community Athlete Program was created as a way to honor the service and sacrifice of Marine Raiders, both past and present, one race at a time. As a Community Athlete, each mile you run, walk, hike, ride or swim will double your impact: you’ll both physically challenge yourself and help the Marine Raider Foundation move one step closer to improving the lives of Raiders and their families. Proceeds raised directly support wounded, ill, injured and transitioning Raiders, their families, and Gold Star families. Whether you are a seasoned athlete or participating in your very first competitive event, you will make a positive impact in the MARSOC community by showing our warriors and their families that you are grateful for their service and that they will never be forgotten. 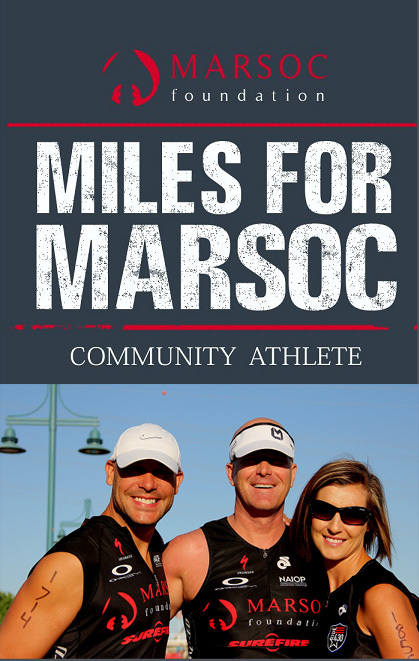 MILES FOR MARSOC was created in 2012. More than 150 men, women and children from all over the world have participated as Community Athletes, helping us raise $300,000! Please join our team today and become a MILES FOR MARSOC Community Athlete or proudly donate to support those who race on behalf of Raiders and their families!